(Francisco Kjolseth | The Salt Lake Tribune) The Salt Lake City Council is on track to authorize a November referendum seeking voter approval for an $87 million bond to fund up to 10 years of catch-up road repairs. The new money for roads would more than double the amount of maintenance the city could do each year — from 75 to 155 lane miles. One road in need of repair is 1700 East near Emigration Market in Salt Lake City, where clear signs of damage can be seen on Monday, July 2, 2018. Two-thirds of Salt Lake City’s roads are in poor or worse condition, according to a pavement survey the city commissioned last year. It’s a reality caused by aging, coupled with a lack of prioritization and underfunding in city budgets for road maintenance before and after the 2008 recession. And if something isn’t done soon, the roads will continue to grow worse. 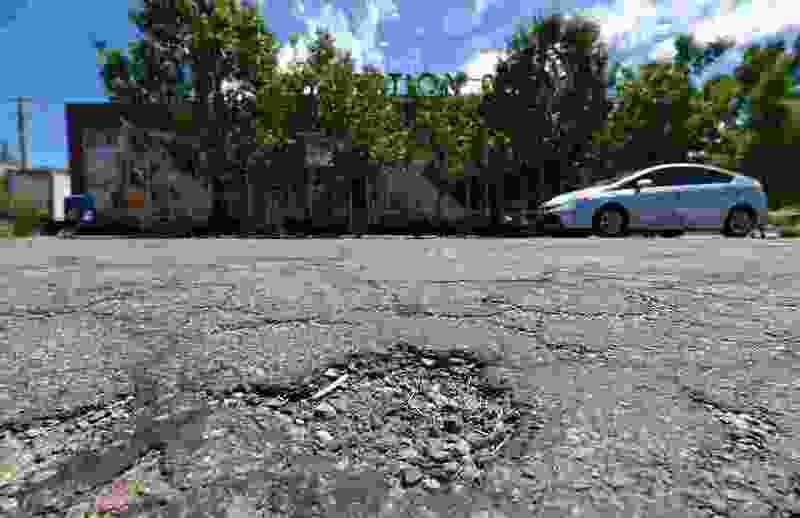 But city officials say the timing is right to fix the streets, and the City Council is gearing up to pass a resolution that would put their plan for an $87 million road reconstruction bond on November’s ballot. Then it would be up to residents to weigh in. Road maintenance isn’t just a problem for Salt Lake City. Funding is so bad in some areas that Domino’s, the pizza chain, has started paying construction crews to fill potholes across the country. As part of its “Paving for Pizza” marketing ploy to protect its pies from bumps in the road, the company has fixed at least five holes in Burbank, Calif.; eight in Bartonville, Texas; 40 in Milford, Del. ; and 150 in Athens, Ga., according to the company’s website. “It’s a thing that pretty much all cities are struggling with, is the funding … has never been enough to maintain the streets,” says Salt Lake City Engineer Matt Cassel. But the issue is growing urgent in Utah’s capital, he says. 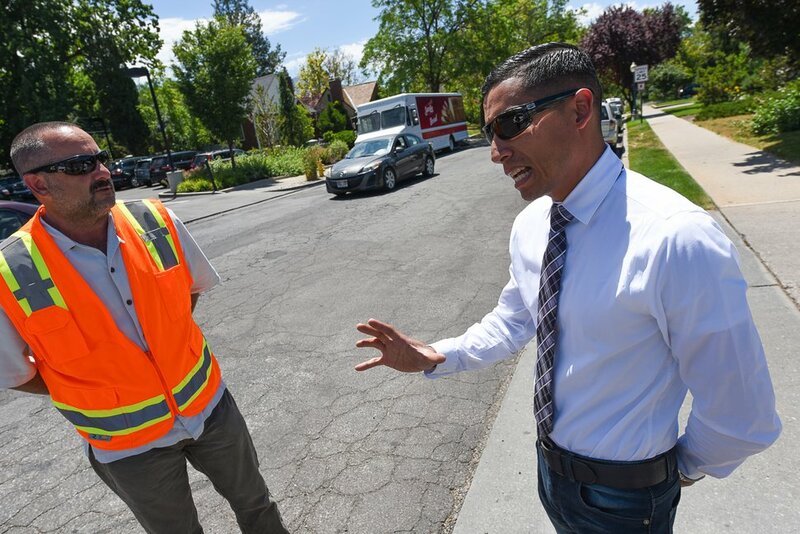 (Francisco Kjolseth | The Salt Lake Tribune) Matt Cassel, city engineer, left, and Adan Carrillo, a civic engagement specialist, discuss the differences between streets that need to be maintained and streets that need to be completely rebuilt during a recent tour of trouble areas and new roads in Salt Lake City on Monday, July 2, 2018. The Salt Lake City Council is on track to authorize a November referendum seeking voter approval for an $87 million bond to fund up to 10 years of catch-up road repairs. The new money for roads would more than double the amount of maintenance the city could do each year — from 75 to 155 lane miles. As Salt Lake City Mayor Jackie Biskupski walked across the street, her foot sank into a “massive hole” filled with water. “I almost broke my ankle,” she says, pulling up a photo of the pothole on her phone. After Biskupski snapped a picture of the road, she submitted a request for service on the SLC Mobile app. And though there’s no button to press for “my street needs to be reconstructed,” Elizabeth Buehler, who works as the city’s civic engagement manager, says pothole-fixing requests are among the most common. In the first six months of 2018, the city received 263 requests through the app. As part of its efforts to address road maintenance, the City Council unanimously approved a half-percent increase in the city’s sales tax in May that will also be split among other initiatives, including expanded bus service and more police. Separately, Salt Lake County recently endorsed a $58 million countywide sales tax hike for roads and transit, meaning the city’s sales tax will climb from 6.85 percent to 7.6 percent in October with both taxes. That county sales tax will bring in more than $5 million a year in revenue to the capital, while the city’s own tax will generate about $33 million annually. If passed, the money from the proposed 20-year bond would be used for road reconstruction; the money from the sales tax increase would go toward road maintenance. The city would have 10 years to spend the bond funds. The impact of the road bond on residents would likely be an additional $5 in property taxes per household per year, since the city is paying off existing bonds in 2019 for the Main Library and The Leonardo, and residents will no longer see taxes for those. If the bond didn’t pass, the city estimates average property taxes would decrease approximately $41.35. The city plans to fix the worst roads first, using the data from its road survey. Eighty percent of the bond money would go toward fixing heavily traveled roads, Cassel says, and the rest would go toward repairing roads with less traffic. Standing outside Emigration Market on 1700 East, the midday summer sun beats down on Cassel’s neck as he looks down at the aging pavement. The average cost per lane mile of that kind of reconstruction is $500,000. But if the city had put resources into maintaining the road earlier, the expense would have been far less. Proper maintenance can extend the life of a street anywhere from 25 to 30 years, Cassel notes. And it’s much less costly to do maintenance every seven years than to wait until the road needs to be reconstructed. Without any maintenance, a road could go from very good condition to very poor condition in 12 to 18 years. Roads “take a beating” a number of ways, Cassel says, including from the sun, Utah’s winters and the constant pounding of cars. But once water has saturated the soil underneath a street, it will ultimately begin to fail. Salt Lake City roads have become so poor that Cassel says the $87 million is just a piece of what’s needed to bring them up to fair condition — a heavy lift that would ultimately cost $220 million. The cost to bring the roads to good condition would be even higher, around $480 million. City officials say they have no estimate for how much taxpayer money could have been saved with improved road maintenance over the past few years. 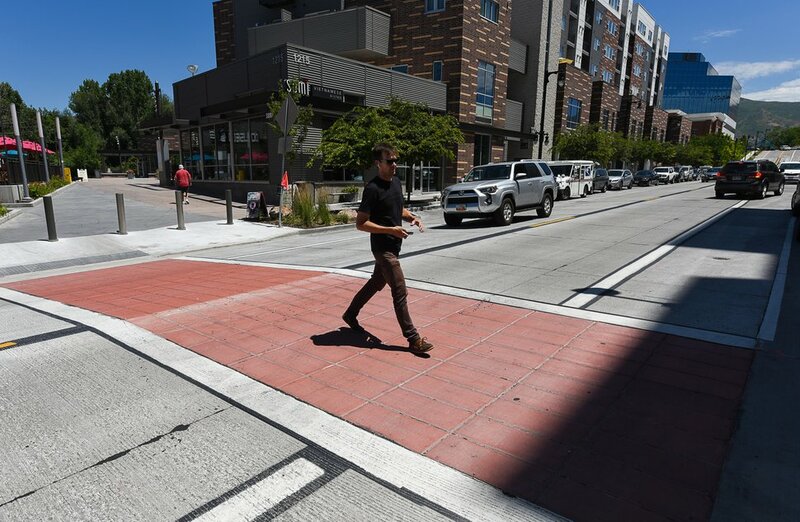 (Francisco Kjolseth | The Salt Lake Tribune) City officials give a recent tour of streets in Salt Lake City, including an example of a "complete street" along Wilmington Avenue just west of Sugar House Park that addressed bike, pedestrian and transit aspects in the rebuild. The Salt Lake City Council is on track to authorize a November referendum seeking voter approval for an $87 million bond to fund up to 10 years of catch-up road repairs. The new money for roads would more than double the amount of maintenance the city could do each year — from 75 to 155 lane miles. Wilmington Avenue, in the Sugar House neighborhood near 1100 East, not only has a brand-new concrete road but also has wider sidewalks, a bike lane and bike parking. “It’s just taking into consideration a lot more means of moving around than just cars,” says Cassel, who notes that the area mirrors the city’s goals with road reconstruction as part of its “complete streets” philosophy. Before breaking ground on a new road, the city also plans to partner with public works to ensure utilities, like water lines, are replaced at the same time, so a road isn’t torn up twice. Many of the city’s road reconstruction projects, of course, depend on the bond’s passage in November. What if voters reject it? “That would be a bummer,” Biskupski deadpans, generating laughs from staff in a conference room at City Hall. “Let’s talk about that after,” Mendenhall says, flashing a smile. To keep the roads from going back to where they were before the $87 million bond, the city recently employed a second maintenance crew with the funds from the sales tax, which will double the number of miles the city can maintain per year. Cassel says he hopes that will build confidence from residents that the roads won’t deteriorate to the same level again. The council will hold a second public hearing on the road bond at its Tuesday meeting, where residents are invited to express their opinions on the issue. The council is expected to vote on whether to put the bond on the ballot at its Aug. 14 meeting.